With there being so many specialist trades on site it's important for the Principal Contractor to carry out dimensional checks. SES offers a non bias approach to reporting the facts. Results are compared to the design information and reported clearly as AutoCAD drawings. More often than not, deviations from design creeps in as a project races to PC, these costly errors never contribute positively to a successful project. Our team at SES believes our as-built surveys are an insurance policy the construction manager cannot do without. When a client wants to refurbish an existing building it's important to work with up to date as-built information as old record drawings may be inaccurate. Our as-built surveys record the variations/deviations to key elements of a structure i.e. 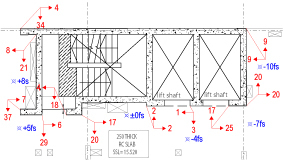 structural slab levels, lift thresholds, column positions etc. For the purpose of recording the actual build position and/or the release of retention we at SES understand the importance of as-built surveys.